With 2011 just around the corner, an ARRA readiness assessment can help hospitals identify what’s missing from the meaningful use equation. Two million dollars would make any hospital executive’s head turn, and since many facilities may potentially receive much more than that through the American Recovery and Reinvestment Act (ARRA), industry experts suggest healthcare organizations take steps to assess their readiness to meet the upcoming meaningful use deadline. Many hospitals across the nation must make significant investments to get up to speed with the criteria spelled out in the incentive package as it relates to EMR use. Specifically, the 23 stage-1 meaningful use criteria require electronically capturing key patient statistics, physician documentation and orders, and developing the ability to share data with other healthcare partners. 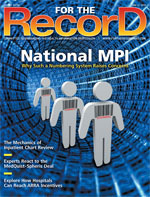 “A readiness assessment is looking at the underlying capability of an organization to reach the meaningful use deadline,” explains Paul Rosenbluth, principal consultant with Dell Services Healthcare, pointing out that hospitals must develop a road map for how they will meet the initial deadline for capturing the full incentive between 2011 and 2013. ARRA allocates more than $17 billion to implement EMRs and an additional $3 billion to improve the nationwide healthcare technology infrastructure—money that will likely be earmarked for the expansion of health information exchanges and regional health information organizations. While the rules for stages 2 and 3 have not yet been published, many industry professionals believe they will continue to move in the direction of greater interoperability and data sharing between healthcare partners. According to Burchill, a readiness assessment often starts with organization governance and structure—an examination of a facility’s current strategic plan and capital investment rollout. It also means taking an unbiased look at attitudes toward technology, beginning with the C-level suite and physician board and moving down to clinical staff. Rosenbluth encourages hospitals to be flexible and open to changing priorities that will place them at the forefront of readiness when it comes to meaningful use. He adds that it’s incumbent on organizations to have a proactive road map in place because expectations will continue to rise. Burchill notes that when it comes to readiness assessments, some healthcare organizations will resist changing financial priorities, but thus far he has not found a single situation where it would be better for a hospital to wait to comply. Tomball Regional Medical Center, a 357-bed hospital serving 250,000 residents in northwest Houston, hired Beacon Partners to gauge where it stood in terms of qualifying for federal funds. The project provided directional assessments of IT positioning and organizational capacity to achieve meaningful use criteria with an emphasis on identifying weaknesses in IT platforms and applications as well as quality reporting and privacy and security. “We essentially identified gaps and helped them understand the work they needed to do,” Burchill says. Tomball’s ARRA assessment was completed in four phases that encompassed a gap analysis of IT platforms, capital planning, operating budgets, operational considerations, medical staff structure, and staffing considerations. A detailed financial analysis of the ARRA incentive payments provided a baseline to review the organization’s current IT planning in a multiyear time frame that was paralleled against the current meaningful use definition. Hospitals also need to factor in the potential for penalties. Trend reports compiled by the American Hospital Association reveal that 55% of hospitals do not believe they will be able to demonstrate meaningful use by the 2015 deadline and will incur penalties. Akers says a number of smaller entities depend on vendors to get them from point A to point B and cautions that hospitals need to recognize where their vendor is taking them. Readiness assessments for hospitals should include an understanding of technology needs for compliance, process changes that will be required to comply, and broader needs to meeting health information exchange requirements expected down the road. Akers points out that the assessment and resulting road map should allow for adequate time to put systems in place. She says a thorough analysis of finances, strategic plans, and workflow needs will take a minimum of four to six weeks and several months for large hospitals. Implementations can take months with training taking even longer. Experts agree that a readiness assessment is not just about IT or finance. Many players need to be part of the effort to determine what it will take to fill in the gaps to meet the stage 1 meaningful use deadline. Rosenbluth points to the potential benefits of bringing in a third party to help create a realistic plan, noting that most institutions simply don’t have the resources or the time to conduct a thorough analysis on their own. “Organizations should be engaged in self-assessments, but there is value in being challenged by a third party,” he says, suggesting that without an outside perspective, providers have a tendency to rate themselves higher than realistically warranted. Looking ahead, Marino suggests healthcare organizations focus on technology that is scalable and will be able to meet health information exchange requirements in the coming years. Specifically, he says EMRs will need to evolve to the point that patient information can be extracted in a “meaningful” way by physicians.